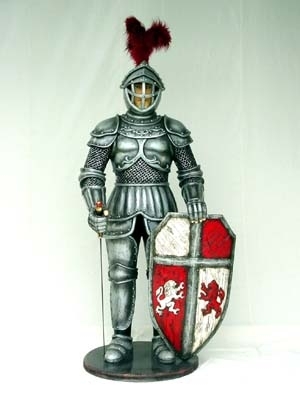 Every girl should have a Knight in shining armour! This one will never answer back. Standing at well over 6ft tall our replica Knight statue is a superb alternative to a suit of armour to add to a medieval theme. 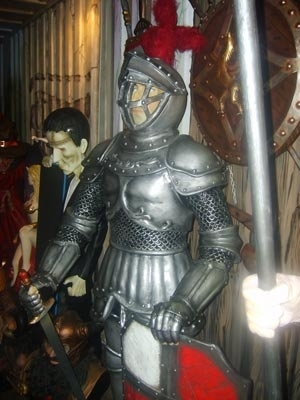 Our resin statue of a life-size Knight in armour and chain-mail is a very striking figure. He is fantastic to use in a historical setting as he is very well detailed with his plumed helmet, sword and painted shield. 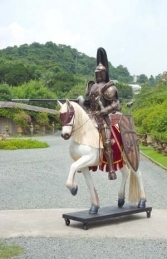 This model can be used as a St George figure and makes an ideal pairing with our Dragon model (JR 080081), or with our Knight on Horse (JR 1987).